Before intentionally crashing the GRAIL spacecraft into the surface of the Moon, they took this long series of images and compiled them into this video. It contains two views of the craft as it sailed 10 kilometers above the surface. The split comes about halfway through from a forward facing view to one from behind. No, this is not Boba Fett in a deleted scene from a Star Wars movie. This is for real. NASA plans a “robonaut” on the Moon in 1000 days… from now!? NASA really doesn’t understand how to promote itself does it… How is this not bigger news? Don’t usually post images of an eclipse as there are billions and they happen all the time, but this one seems especially nice. Taken from Northern India. I was away in California for a wedding and my fellow designerds at The Chopping Block made this funny little site (seen above) so people can make the announcement to their friends… or if anyone forgets and needs to be reminded. If you want to be more scholarly about this, the official NASA announcement is here. What makes the discovery more exciting is that the process by which the water exists on our moon means that it likely also exists on other similarly dry bodies like Mercury and the countless asteroids in the Asteroid Belt between Mars and Jupiter. 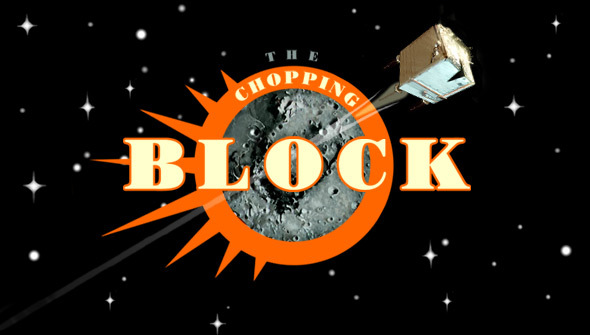 Not as long ago as 40 years ago, but just a little over 10 years ago – The Chopping Block adopted the look of NASA for one of our online incarnations. More specific our adopted look embraced the era of Apollo in hopes that a little of that former astro-glory might rub off on our small New York graphic design studio which was at that time only about a year old. So we thought it appropriate on this 40th anniversary of the touchdown at Tranquility Base, that we revisit our own journey through cyberspace and our small tribute to the historic landmark that is Apollo. If there is one thing we like to do at The Chopping Block, it is to take our logo and make it look like something else. 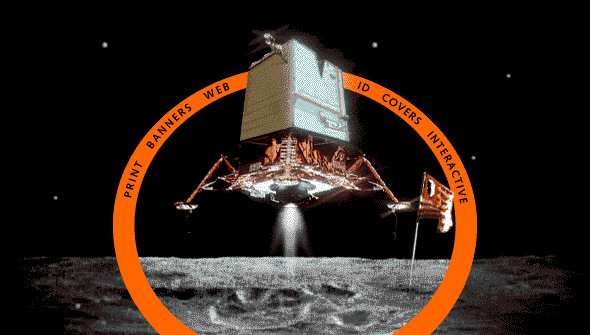 In this case, we became quite possibly the first design company to ever merge the design of the Apollo Lunar Excursion Module with their own logo mark. Thusly, resulting in the world’s first merging of state-of-the-art of 196o’s technology with early web identity design. And what fake space exploration site would be complete without fake astronaut training pix? See the original site as it appeared in 1998 here. Also see our current site choppingblock.com for more recent projects. Lunar Reconnaissance Orbiter is up and out. 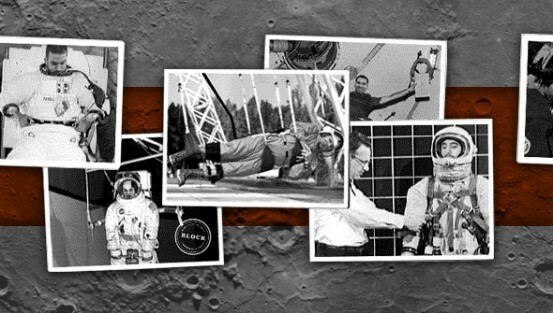 Its mission is similar to that of the Surveyor missions of the early 60's. You wouldn’t think we would be needing to do this again, but it is looking for safe places for future manned missions to land. The exciting part is that it will also be seeking out any potential for much needed resources like water trapped in permanently shaded areas in the polar regions. Not having to pack your water bottles for a long Lunar mission would be a big plus. The best part is that LRO will observe LCROSS smash into the moon and make a big mess in October. The Kaguya moon orbiter has reached the end of its mission and on June 10th the spacecraft executed an uncontrolled impact into the surface of the moon. The impact was captured from ground-based observation (at left) and is the small round flash seen dead-center. One of the mission’s final masterpeices of hi-def video was capturing an Earth eclipse of the Sun for the first time from the Moon. The image at top shows the details in 8 key frames and the actual video can be seen here on youTube.